Marvel and the lovely British actress Emily Blunt must really want to work together. Back in January of 2009, Blunt was rumored to take the role of Black Widow in Iron Man 2, but as we all know, the part eventually went to Scarlett Johansson. Then in 2010, Blunt was on the shortlist to play Peggy Carter in Captain America: The First Avenger, but the role ended up going to Hayley Atwell. 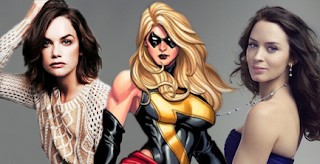 Now rumors of Blunt's involvement in big screen comic book adaptations have come back around as The Daily Mail seems to think that she is currently being "hotly tipped" to play Ms. Marvel in The Avengers 2, hitting theaters in 2015. Knowing the cosmic angle Phase Two of Marvel's cinematic universe is going, this doesn't seem to be out of left field. However, the Kree haven't been introduced yet. So does that mean Whedon will bring the alien race to the big screen? Or will he somehow use the Chitauri race to bring about the same disaster for Ms. Danvers? It remains to be seen as this is all just a rumor for now, but the prospect of introducing this character as a new installment of The Avengers is interesting. Ruth Wilson (Anna Karenina, "Luther") is apparently also in the running. Having a single name is one thing, but two different actresses, including one lesser known name who has never been a part of dream casting rumors, makes this rumor seem pretty legitimate.